The Chef seemed keen to get me out of bed this morning despite the fact there was little much to do today. Still she's right, lying in bed all day must be reserved for old age. We both skipped breakfast because by the time we'd been sidetracked with bits and pieces (I'll usually sit online and find out what's happening in the world, including whether or not Donald Trump has pointed to a Trident missile and said "You're Fired!") it was too late and would be lunchtime before long. The most painful part of today was paying the bill for our first four weeks campsite fees here. Including electricity it came to €541, just under £500, not bad if you grit your teeth and say it quickly. It was much cheaper when the exchange rate pre-Brexit Referendum was much better. Never mind, freedom always has a price. I will give a breakdown of our total costs once we're home. It may be useful to anyone considering such a trip themselves. After that The Chef and I wandered down to the town for a few bits and pieces, and they were a few, because my thinking now is that we'll drop by Gibraltar on our way south, park up, nip across the border for the day and buy bits we need, possibly in the town, but certainly in the really busy and large Morrison's supermarket they have on the rock. 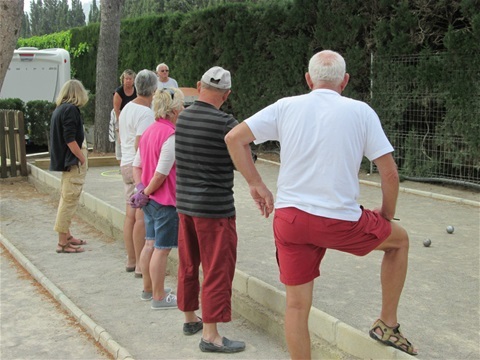 When we were down town in Benicassim on Saturday evening and checking out the motorhome parking area, I noticed one of those facing south had two deep steel buckets hanging from a frame on the back of the vehicle, both filled with water, and I wondered why. It came to me last night. They were being used to heat water using the power of the sun, important when you're 'wild camping' and not hooked up to electricity. So one of my few purchases this morning was a small galvanised steel bucket for €5 to test the theory. So far not so good. Lunch was a very British affair. The Chef wanted to get rid of the remaining chips in the freezer and so we had chips baked in the oven together with a lovely crusty baguette from Lidl, in our opinion the best in the area. Of course, for me, they had to be anointed with Heinz Tomato Ketchup. 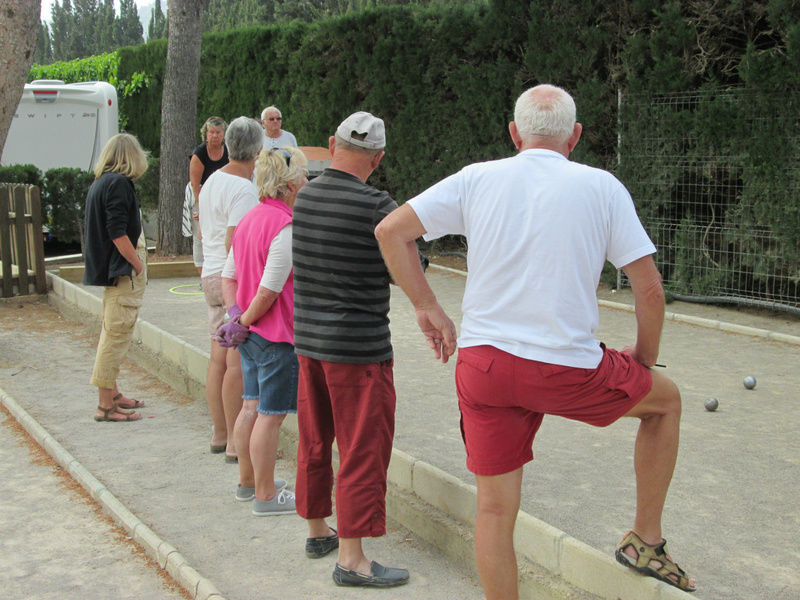 This afternoon we wandered up to the Petanque pitches. We were thinking that there would be very few folk up there as Brits and other northern Europeans continue to leave heading for home. But no, it was one of the busiest sessions we'd seen. I think word is spreading amongst the hopeless players on site that there are two players turning up that even they can beat. To be fair to The Chef though she does pretty well. Me, I'm less than consistent. Whilst we were playing the sea mist rolled in. We've had it before but this afternoon it came in quickly, thickened, and stayed. It became almost like a fog. So much so that the temperature dropped an awful lot requiring jumpers to be worn and books to be read indoors, and worst of all causing my warm-water-from-the-sun trial to be less than successful. I shall persevere until we leave. If it's eventually successful I shall need to buy a second bucket, and if it isn't I've got to find a use for the one I've just bought. We've just watched the Six O'clock BBC News at Seven o'clock here. They say that Theresa May will trigger Article 50 on 29th March. It's been a long time coming but I think we just need to get on with it now. This evening is to be spent in the company of my darling Chef, probably watching yet more 'Only Fools & Horses' on DVD unless the TV can offer us a better alternative. The plan for tomorrow is to have a nice long bike ride, trying again to reach Castellό de la Plana. This is to be our last week here so we've got to have another go at it, and hope that The Chef doesn't get saddle sore this time. It will also give me the opportunity to take a photograph of the exterior of the restaurant which overcharged us a couple of weeks ago. I can then include it in my review of it for Trip Advisor once I manage to get it listed. Looking at the weather forecast we need to be finished with the bikes by the end of Wednesday so that I can get them stowed away in the rear garage on Thursday the driest and best day of the week, though of course these weather forecasts have been known to be wrong.